Computational thinking is used when specifying and implementing algorithmic solutions to problems in Digital Technologies. For a computer to be able to process data through a series of logical and ordered steps, students must be able to take an abstract idea and break it down into defined, simple tasks that produce an outcome. This may include analysing trends in data, responding to user input under certain preconditions or predicting the outcome of a simulation (from australiancurriculum.edu.au). 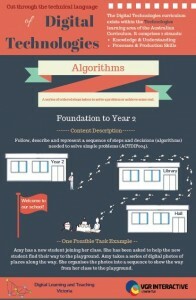 Digital Technologies – Algorithms In Plain English from Digital Learning & Teaching Vic on Vimeo. Decomposition: to separate a complex problem into parts to allow a problem to be more easily understood. 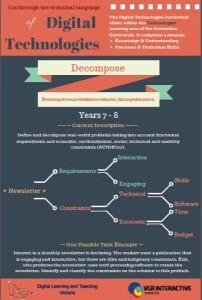 Digital Technologies – Decompose In Plain English from Digital Learning & Teaching Vic on Vimeo.